Cup Cake Cross Stitch Kit, Three tiers of luscious cupcakes in a pretty antique pastel colour pallet. Kit contains 16 Count Cream Cotton Zwiegart Aida and DMC embroidery thread. 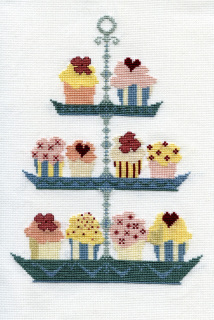 You will love stitching this 'Cute as a Cup Cake' design almost as a much as you love to eat them. 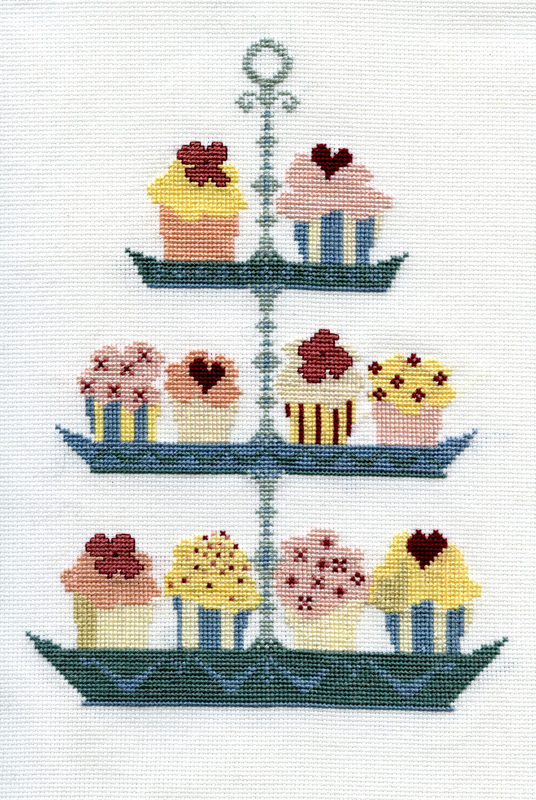 This scrumptious cross stitch kit pictures three tiers of luscious cupcakes. I selected the pretty antique pastel colour pallet for a classical feel, reminiscent of the tea parties of times gone by. This kit is hand packaged with loving care and comes prettily packaged making it a fantastic gift for any experienced or wannabe crafter. All the materials within the kit are of the highest quality, ensuring a beautiful, long lasting finish. a piece of 16ct (16 holes per inch) antique white, cotton Aida to work on. and finally, getting started instructions for any beginners. The kit contains functioning embroidery needles; therefore the recommended age for this kit is 12+ years. Once finished the cake stand is 21cm x16cm. Although this design is relatively easy, as it does not contain a lot of colour graduation, as it has slightly smaller stitches and is on a slightly larger scale, it does require a little dedication to complete. For regular crafters, be assured, this is a good thing. Less enthusiastic crafters however may prefer one of my less challenging kits to get them started. Take a look at my 'Butterfly Tea Room' design for a simpler option.